My Audible biographical journey continues and I continue to enjoy the overall experience. Seeing the world through the eyes of other (famous) people is certainly one way of looking at things and its easy to come to appreciate what insights they have to share. Plus choosing to stick to audio books read by the author is proving to be a most rewarding experientially speaking. Yes Please is the autobiography of the Saturday Night Live veteran Amy Poehler, a truly funny woman whose work I've come to love and appreciate over the years. I wasn't quite sure what to expect from this piece, which was really an admission of not knowing much about her beyond her professional work. But once I got into it I was quickly hooked by her often practical insights on a wide variety of subjects all presented in a relatively humorous manner when appropriate. This book is a gem. 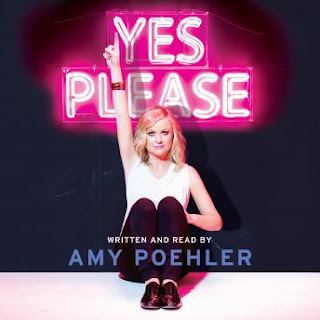 Synopsis: Yes Please is part-memoir, part-advice book as written by Amy Poehler. This audio book was nominated for Best Spoken Word Album at the 58th Annual Grammy Awards. Like many other biographies, the book touches on various parts of Amy Poehlers life while relating them to things she learned at the time or maybe particular feelings she wants to capture. It's very personal but at the same time it's also somewhat formal in a way that only makes sense if you've seen Amy Poehler perform. As the book progresses the book shifts more into lessons on life based on her experiences, particularly as a woman in the largely male-dominated world of comedy. She also touches on her experience as a working mother and other bits in a very frank and candid manner. What I Liked: The audio book is a unique experience as the potentially dry words are brought to life with Poehler's classic tone of delivery. Together with some interesting guests who also contribute to the book, the resulting narrative has a nice cadence to it and a bit of variety that keeps things interesting. As much as Poehler is a woman known for her comedy, what really brings it in this book is her delivery. What her words do deliver are some honest learnings about life that she felt were important enough to share with everyone. And she does have some very interesting things to say. What Could Have Been Better: In terms of the text itself, there's not much to be said. It comes off as a little dryer than you'd hope. The book is a serious effort to talk about her life but naturally people will still expect something immediately funny coming from the likes of Amy Poehler. But a lot of her comedic value is sort of the character is serious and relatively oblivious to her eccentricities. And that doesn't always come across well as just written words. If anything, the book eventually starts to feel a lot heavier on the advice side versus the biography side and that may or may not sit all that well. She means well and I get where she's coming from but naturally there's a need to balance the initial desire why anyone picks up a celebrity biography - to know more about their celebrity lives and how they go there. TL;DR: Yes Please is much better as an audio book experience and it is a written material but on the whole it's still a great book. It's one that has a lot of heart and means well and is a bit more serious than you may expect - and that's not a bad thing. Thus the audio book gets a good 4 stories of Amy Poehler being a plucky young woman out of a possible 5.